‘Satisfying’ videos are trending at the moment. We thought we would have a go and make one of Keith bending one of the components we make. In celebration of the fourth anniversary of purchasing a new HFE 130T 3m Press Brake from Amada, our Fabrication Department has updated our clamps to the new reversible ‘AGrip’ clamp. 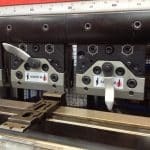 This will enhance our customer service by improving the handling efficiency of sheetmetal work and laser cut profiles.